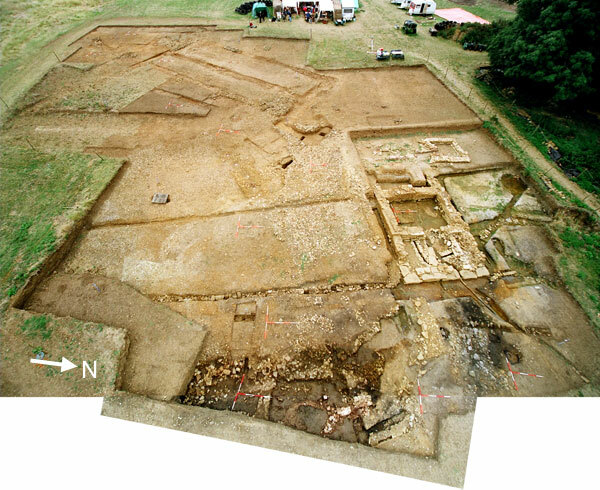 NB: At the end of the 2008 dig, substatially more the older bath house at the bottom of the photo had been uncovered: that it was indeed a bath house is now fairly well established. This very wide-angle, composite image is distorted spherically - closer features (seen vertically) appear much larger than they really are in relation to distant features (see obliquely). Copyright of this web site, including all text and images (except where otherwise stated), belongs to The Whitehall Farm Roman Villa and Landscape Project. No part of this website may be reproduced in any form without the prior permission of the Project.